Skinny Dog's Esoteric Bouldering Guide. : Its whats inbetween that counts. Its whats inbetween that counts. Unexplored coasts full of potential. I went to Mid Wales during my Easter break, visiting friends amongst the vivid green Cambrian corrugations that make this part of the world so special. The seaside town of Aberystwyth stands as a halfway point on my own personal timeline - looking South to my past and North to my present; as such it occupies a unique place in my personal geography. Usually a trip to this part of the world would lead to a coastal adventure at Clarach and Borth (read about previous trips here, here, here and here) or alternatively in Barmouth or Cae Du, however on this occasion time and tide were against me. The alternative was clear and I looked South and to the past for adventure, focussing on the county that I called home for the first 19 years of my life. 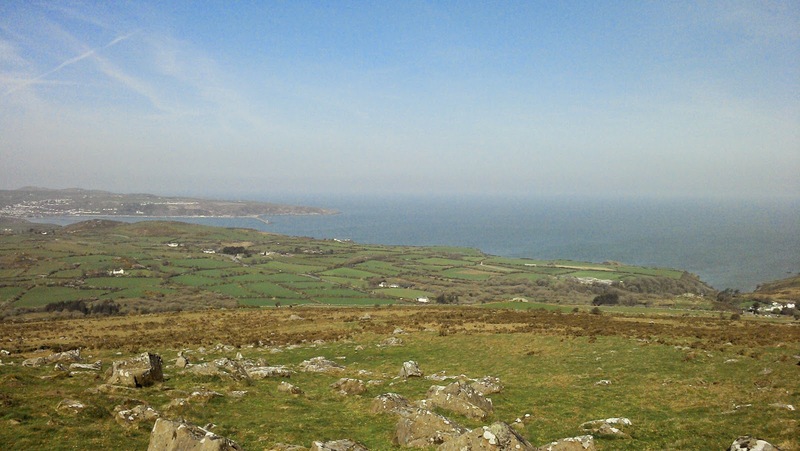 I headed back to Newport in North Pembrokeshire, to Mynidd Dinas and the developed dolerite crags that crown the northern flanks of the Preseli hills. The A487 coastal road draws you south from Aberystwyth to Newport; a tarmac trail that hugs the edge of civilised cultivation before it drops into the wild surf below. Vistas of sea and cliff rob you of your conscious self, testing your powers as the mind drifts and the smell of brine hangs heavy in the air. Villages which have fed the Welsh diaspora, depopulated by the Pied Piper of progress and urban dreams, tick by; acting as a yardstick on a journey so stunning that you lament its end. Every mile reveals another ripple in the rocky coastline: beaches, coves and cliffs tempt you to stop to see what potential might lie there. However time is a cruel mistress, When it is short you will always drive on to established venues, developed, described by a book leading to you to an experience that deftly fits into the few hours you have; leading you to ignore what lies in between. 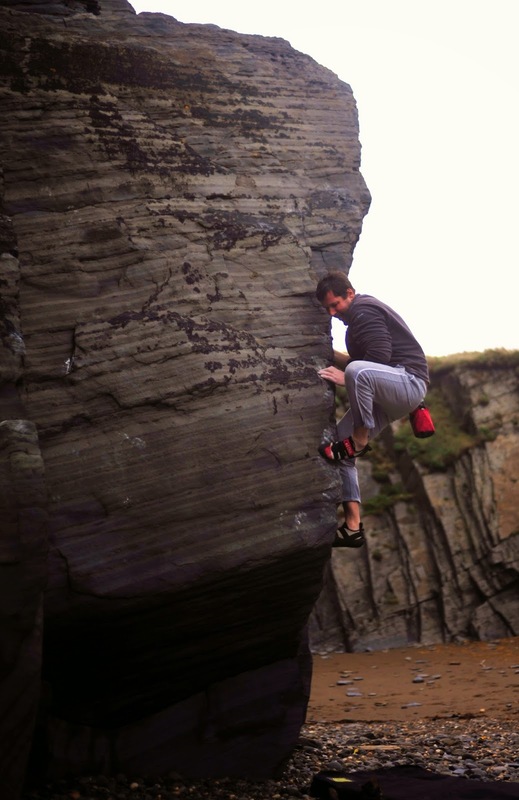 Newport features highly as one of the main bouldering areas of Pembrokeshire in the new Pembrokeshire Climbers club guide (Volume 1 Pembroke North). Above the town there are rhyolite crags such as Carn Foi and Carn Cwn, developed to an extent but with lots of potential for further lines. Although looking at the guide, I found myself climbing the lines that existed in-between those reported, in-between the brush marks, in-between the established. And my thoughts returned to the drive: to the coast, to what may exist undiscovered and untouched in-between the pages; existing in the unwritten, in-between land and sea. To the South of Newport the Dolerite crags of Mynidd Dinas can be seen clearly from the road. 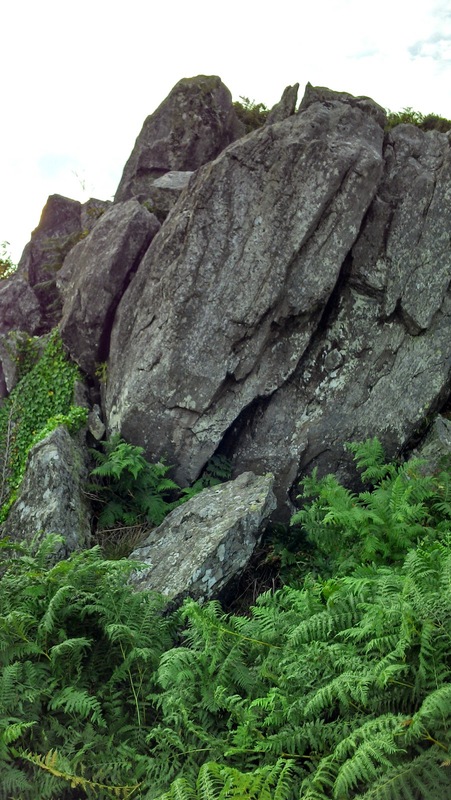 Carn Enoch, Carn Sefill and Garn Fawr are well-known to the attentive boulderer. Not only do they grace the pages of the Pembrokeshire Guide, they also play a cameo in Boulder Britain. In this corner of Pembrokeshire chalk adorns rock, decorating the paths of previous ascentionists and giving a clue to the sequence that may unlock a problem. These crags are by no means fully climbed out, but strong lines draw the eye and the question of what may lay in-between is lost in the industry of the send and intricacies of the line. The view from these high crags on a sunny day can distract even during the focus of a send. The coastline ripples and reticulates lazily and seemingly infinitely both North and South. A glance at the guide suggests there is nothing there, no sport, no fun; and yet you must question what lies in-between. Over the early summer I spent a lot of time on the LLyn, following my namesake Mr Heyward as he developed his way around the peninsula. 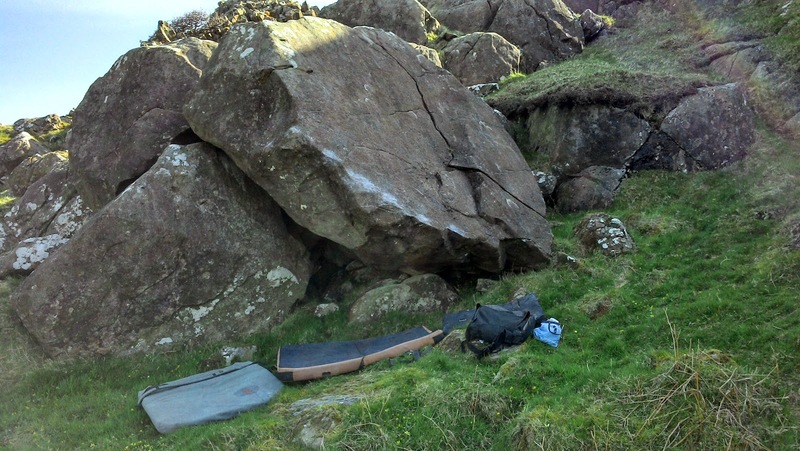 Porth Ysgo and Trwyn Talfarach are established locations on the British Boulderer's map nowadays giving all the rasping experience that only seaside gabbro can provide. However Owen delved a bit deeper and unearthed unanticipated quality. Porth Nefoedd had been reworked the previous winter and new blocks had materialised further along the beach; where climbers had assumed there were none. The Hell’s Mouth block drips with quality, wave-washed dolerite that begs to be climbed. The walk in and the location gives you a real feel that you are 'there' - bouldering at the edge of the map, immersed in nature, unhindered by the complications of the human world. Individuals like Owen don’t wonder about what lies in-between, they seek out the gaps in the map: they find what's there and they fill in the gaps, increasing the size of our shared bouldering world in a time when technology seems to be making the actual world smaller as every day passes. Late July and the commencement of high summer saw me travel back down the A487, back to Newport but on this occasion with time to explore. I passed Aberystwyth, the centreline of my life, with its developed wave-washed shale and drove on to the in-between; where the bouldering map is incomplete and gaps exist. As I passed Llanrhysud, Abeaeron, New Quey, Llangranog and Cardigan I thought of the way the Llyn has been developed recently and looked at this coast and the coast of North Pembrokshire with a new zeal. The bouldering map down here isn’t even a pencil line on the back of an envelope, the areas in-between undiscovered: stretches along the coastal fringe from Clarach to Newgale and then on round to the industrial bays of the Cleddau all waiting for someone to explore them, to tame them and bring them into the fold. So I explored when I was down there. Not too far from an established bouldering venue I found a little bit of class amongst the sandstones and shales: a wall fifty feet in length, twenty feet high at its highest point, overhanging by twenty degrees and covered by enough holds to make this find a challenge (there will be more about this venue another time). Another piece of the map had fallen into place, pushing the bouldering horizon that little bit further out for others to discover. A guide is being written at the moment that will take in some of the areas that, at present, exist in-between the known and unknown. A dedicated group of locals are out there scouring the bays for potential, but why leave the immense task of rewriting the bouldering map to the few? We are the many and the task is large. Instead of spending yet another bank holiday weekend abseiling into an overly used coastal limestone crag in South Pembrokeshire, why not quest north with a brush and a pad? It’s amazing what you can find on that wild, deserted North Pembrokeshire / Ceridigion coastline. Be a map-maker - be creative and anchor your own personal geography to a little piece of coastline that will inspire others.